In ancient Greece, Delphi was considered the center of the world and this sacred place is linked with almost all the Ancient Greek mythology. Today the unique remains of Delphi is located about 160 km northwest of the capital of Greece - Athens. The location where the ancient Greeks decided to elevate the complex was not accidental. It is built on a rock terrace, which rises 600 meters above the sea waters. 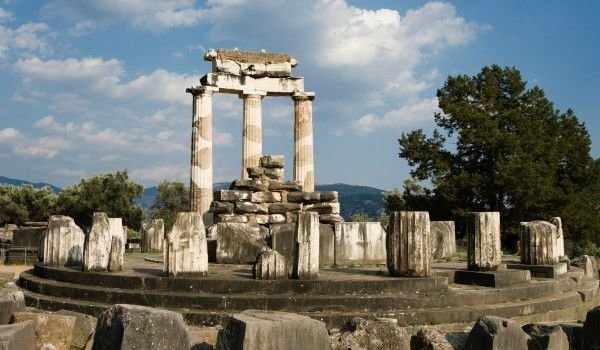 In ancient times, about 8 BC Delphi was a leading religious center for the ancient Greeks, and today its fine remains are included in the list of World Heritage by UNESCO. There, in those ancient times was the famous sanctuary of the oracle god Apollo who was the most honored and respected within the entire Mediterranean. The priceless ruins of Delphi were built mainly from two sites that are less than a kilometer apart. One of them, is the sanctuary of Apollo. Here, various monuments and friezes lead to the temple of Apollo, which leads to the so called, Sacred time. In the west of it is a beautiful Roman staircase which reaches the ancient theater. Nearly 7000 spectators seats are perfectly preserved in the stadium in Delphi , which is in the upper part of the complex. The seats are carved into the rock, while the stadium ends with a triumphal arch at one end. Another major tourist attraction here is the sanctuary of Athens Prohn, which reserves treasuries and several ruined altars. The original building there was built in 7 BC but was destroyed. Three centuries later they built the unique Tolosa in Delphi , which is actually a rotunda surrounded by 40 columns, divided into two lines. From 6th century BC the Pythian games were held there which included musical and sporting events. Today the town of Delphi is located about a kilometer southwest of the sanctuary.